The domino shape just doesn’t get enough respect. You are likely familiar with the fact that the game of dominoes is played with tiles that are like two squares on top of each other. Much to my delight and surprise, about a year ago, mathematician Justin Lanier enlightened me to the fact that this rectangle, which is twice as long as it is wide, has a specific name and that name is DOMINO. This may not seems like such a grand reason to celebrate, but, over the past year, by being able to pull this definition out of my back pocket, both my teaching and my structural problem solving have improved and deepened. There is something about calling something by its proper name that has value. 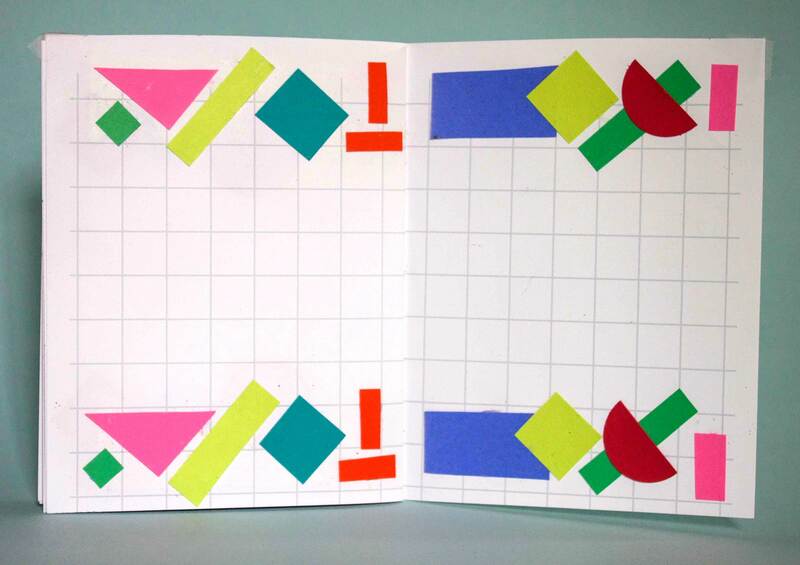 For decades, with thousands of children who have done bookmaking with me, I’ve been trying to figure out how to get students to decorate their books using geometric shapes in a meaningful way. 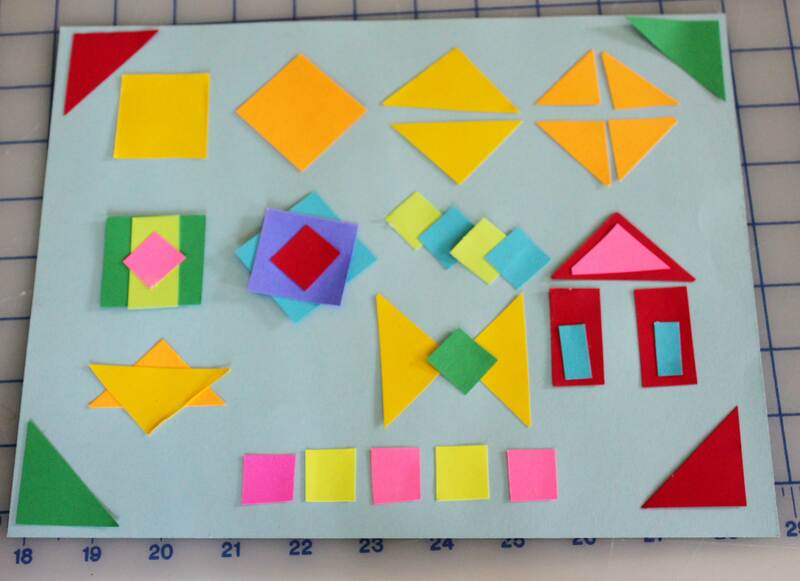 A meaningful way means, to me, getting them to really understand and exploit the characteristics of the shapes. Thousands of children for decades means I can try out one idea after the other, attend to nuance, and maybe even figure out a thing or two. 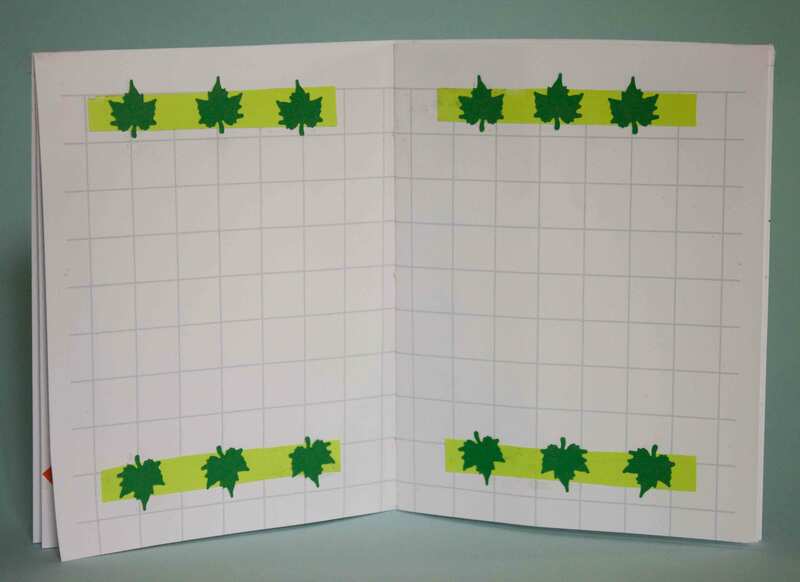 I’ve known for a long time that starting with squares can help reign in the chaos of making decorations for books. 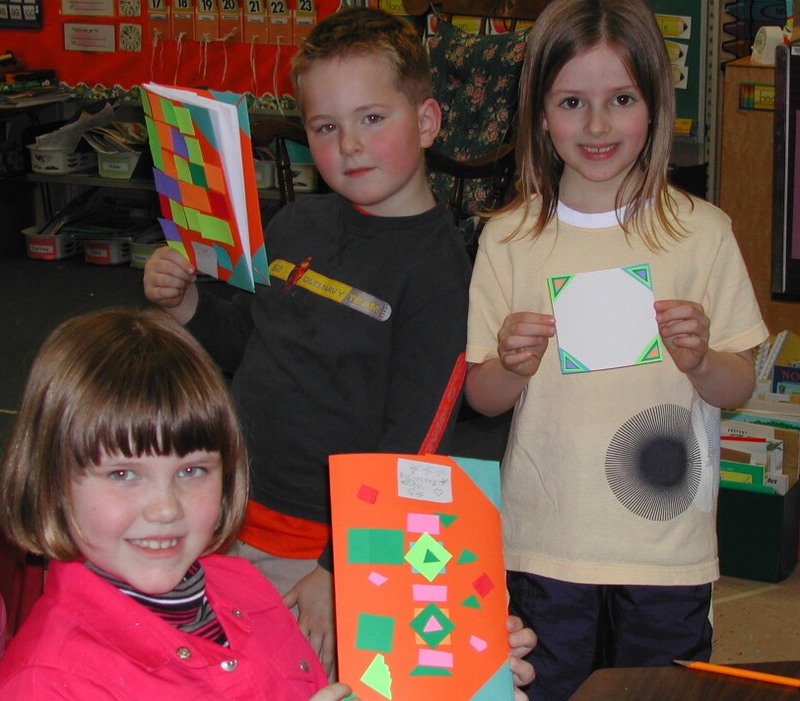 I actually use to cut out and distribute piles of squares to students so that they could work with squares. Yeah, I would spend hours cutting little squares out brightly colored card stock. Even now it’s painful looking at these squares, remembering those late nights of cutting cutting cutting… and then the students would want to smear glue all over their books and sprinkle the squares like candy on them and, when the glue dried, half of the squares would fall off because the gluing was sub-prime. Ok, I’m sort of exaggerating: Many turned out beautifully, but I still didn’t feel like the kids were getting the most out of the activity: they weren’t making the connection that I was hoping for with the square. Eventually I realized that I could give students the double-square shape, though at this point I didn’t know that it was called at domino. 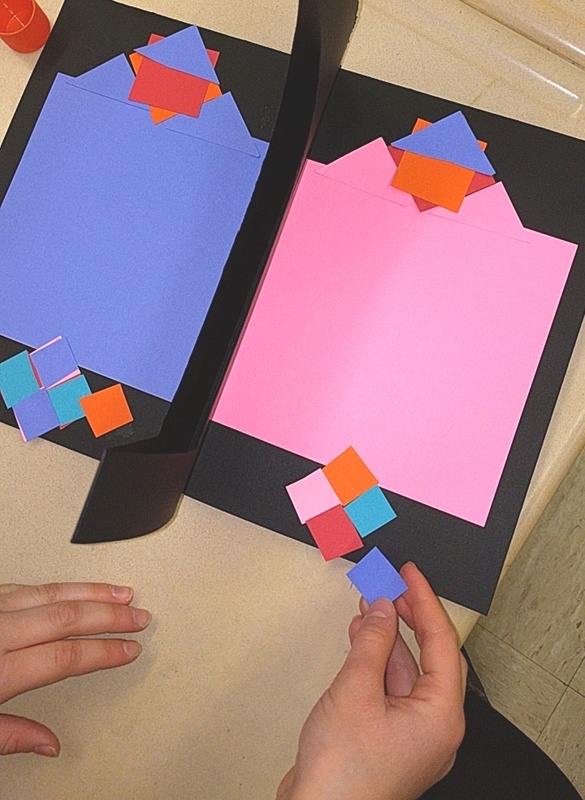 I show students how to line up two of these double-square perpendicular to each other, from which they cut “on the line” that separates the colors, and snip, snip, they have four squares. If they cut the square again, this time by eye, they have scaled down rectangles, and they can then cut these in half to make baby squares. Yes, baby squares. These are young children and young children like baby squares. I also talk to the about rotating the square, cutting it from point to point to make two triangles, and then cutting the triangles in half to make baby triangles. 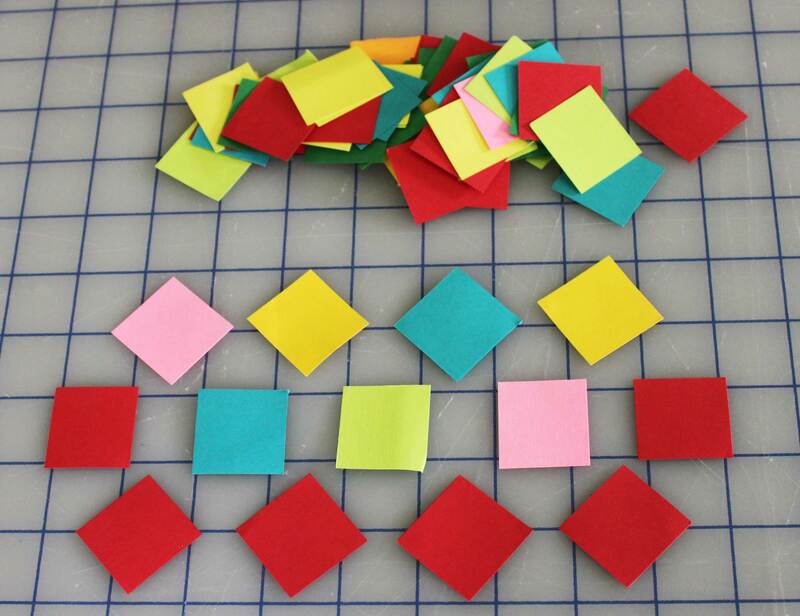 Now just this year, during this teaching season, I have a made a point to introduce the double-square shape by name. The students I work with are shape savvy: they know what a rectangle is and they know that the square is a special kind of rectangle, but their eyes light up when I tell them a that a double-square shape is a special shape too, a domino. Does it make a difference for them to call it by name? I answer that with a resounding YES. It’s been like night and day. Students seem to honor the shape and special qualities of the domino. 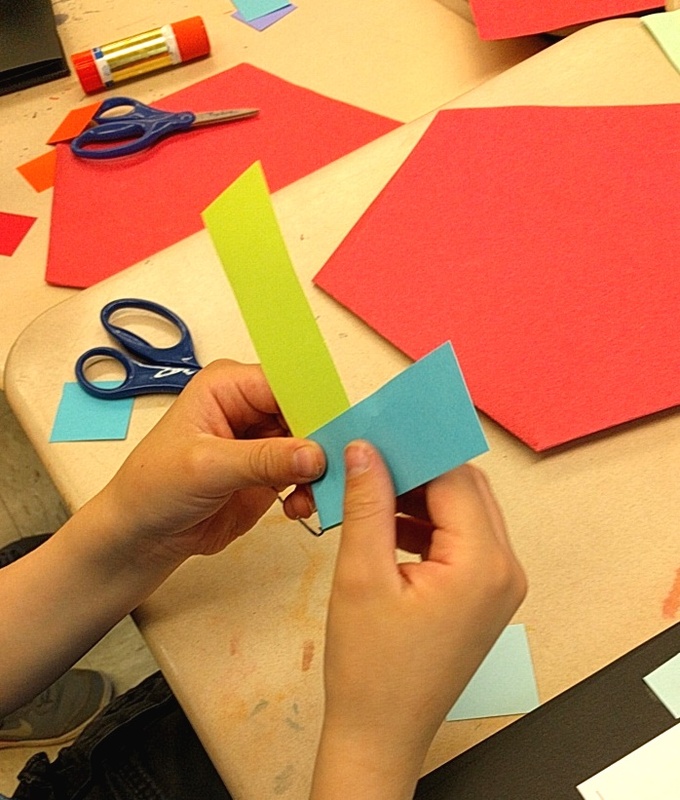 I know this because, with the hundreds of students that I’ve worked with this year, I saw, for the first time, the overwhelming majority of students being at ease with the idea of working with just the shapes that I talked with them about. There was so much less arbitrary cutting of paper, so much less just slapping down whatever shape that emerged from a hastily cut paper strip. Across the board, with the introduction to the domino, students approached this part of the project with a sophistication that I had never seen before. Instead of having to wade through photographs to show the type of work that I think is most valuable to show, I am finding it hard to choose between all the interesting work that these students are making. 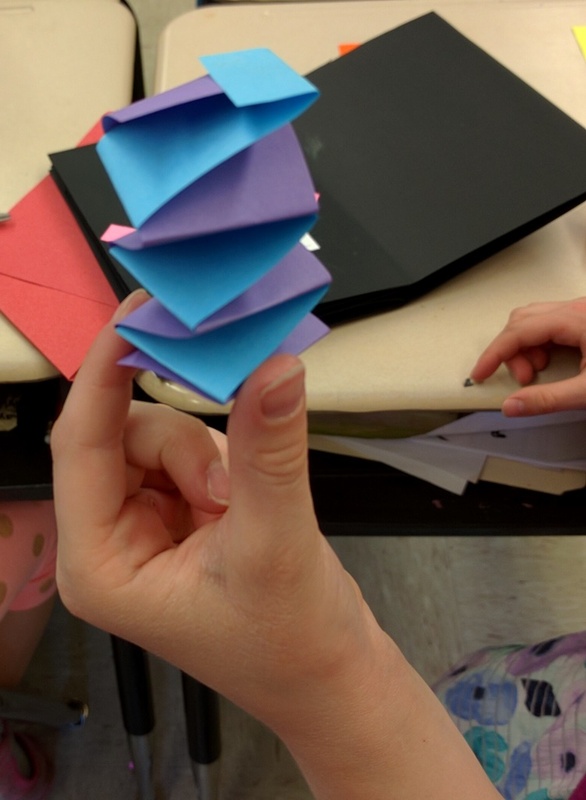 I look at these and I can sense that the student is connected to the underlying structure. If you don’t know what I mean by that, just look again at these photos. It seems to me that I even have metric which tells me that this is not just something I’m imagining. One of the other techniques that I show students is how to make paper spring. This is a challenge for most students, but a worthwhile one, as they love how it gets used in their books. 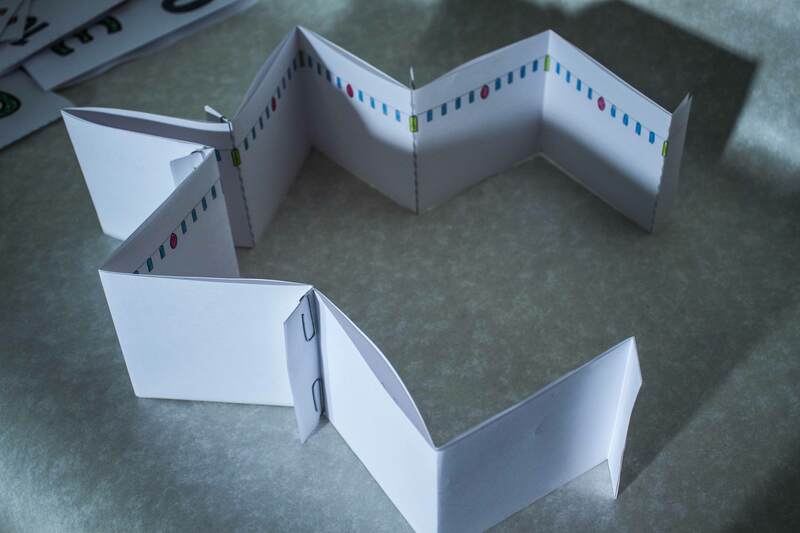 Though not a domino shape, it is made by having an awareness that the two strips of paper they start with are of equal width, and I show them how to weave and rotate the strips down into a square. After first showing them the techniques of decoration with the domino it was astounding how quickly the students understood how to do the spring. In fact, in each class, these parts of my presentation went so quickly and smoothly that I kept checking my notes, thinking I had missed some part of the lesson because there was so much extra time. Needless to say, I have much respect for the domino. For the last few months I have been casually, now more seriously, studying a folded paper structure in Chinese Folk Art, called the Zhen Xian Boa. My plan is to write a number of posts on this structure. It’s not hard to figure out that part of my fascination with the structure is that, from beginning to end, there’s the domino. I’ve begun my winter/spring season of working with schools, doing curriculum related projects with students. 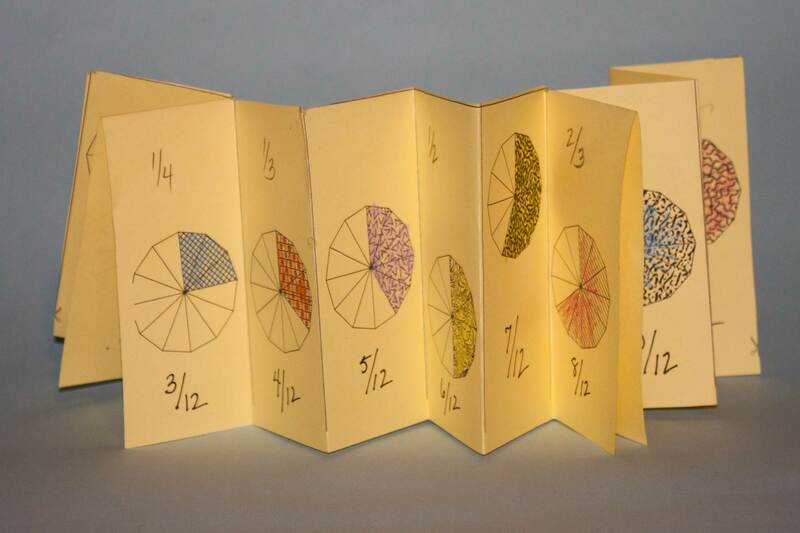 I’m once again revisiting the idea of using books along with fractions. 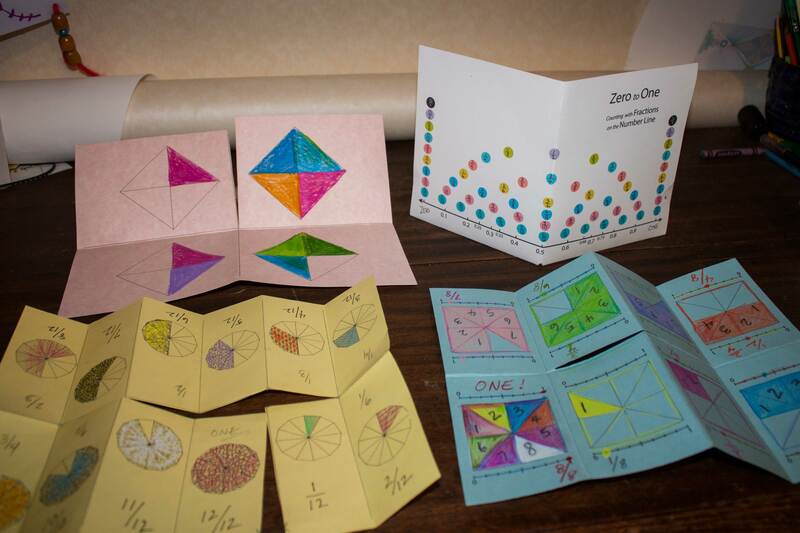 This past summer I had some conversations with Dr. Maria Droujkova about how she uses paper to illustrate fractions. It was such a simple and brilliant idea that it stayed with me. 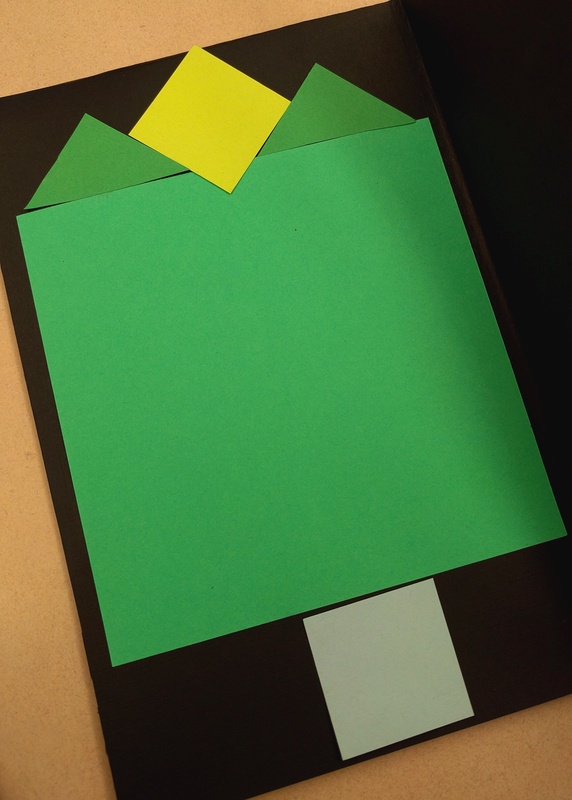 Bookmaking is, after all, folding down large papers to make smaller papers. It’s such an obvious connection that I’ve been too close to see it! Now I’ve built a project around this idea, and tomorrow I will be introducing it to the students. 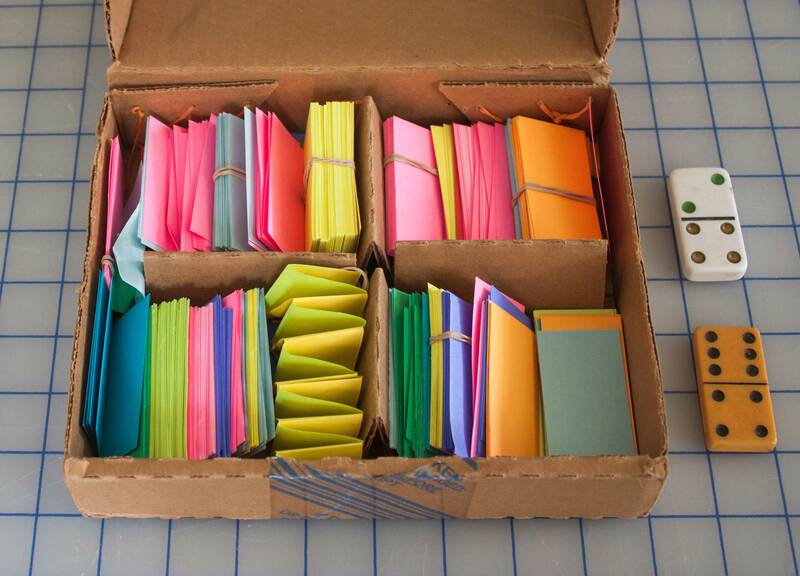 Consider this the before post…the after post will be seeing what the 4th graders do with this! 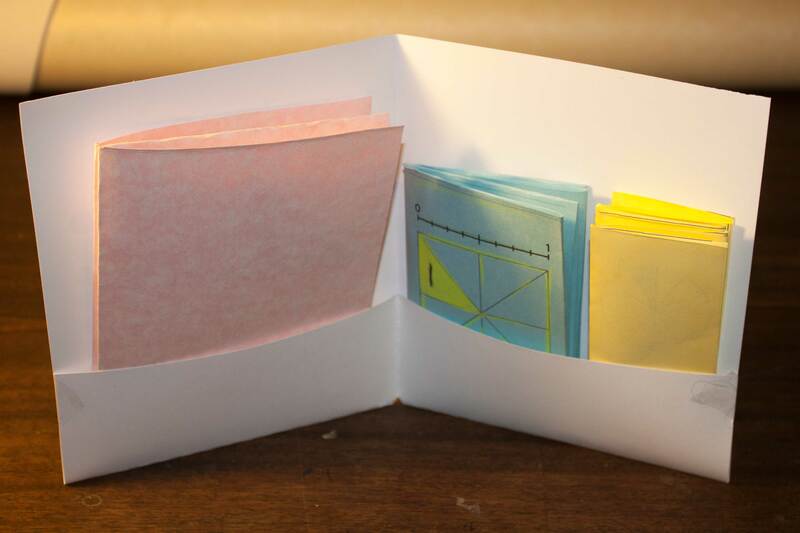 The idea is to start with the same size papers and fold them into books of different sizes: fourths, eighths, and twelfths. They will be in a folder that will be 3/4 of the original size. All four structures start off the same. 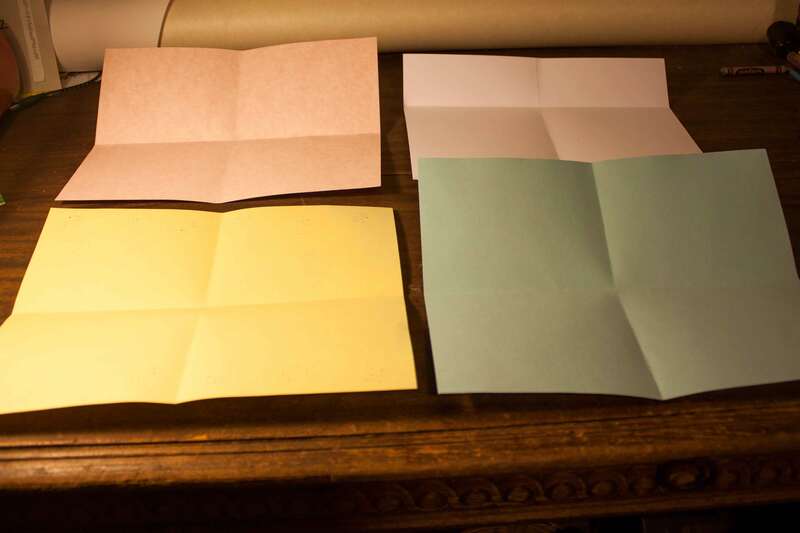 Each paper gets folded in half. 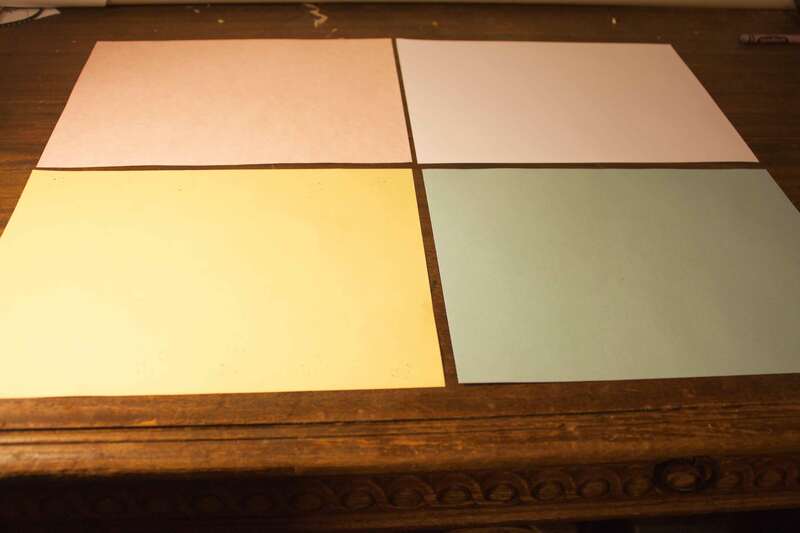 The papers are opened up, then three are folded in half the other (long edge to long edge) way, then opened up again. The folder (far right, above) is folded up 1/4 of the way. 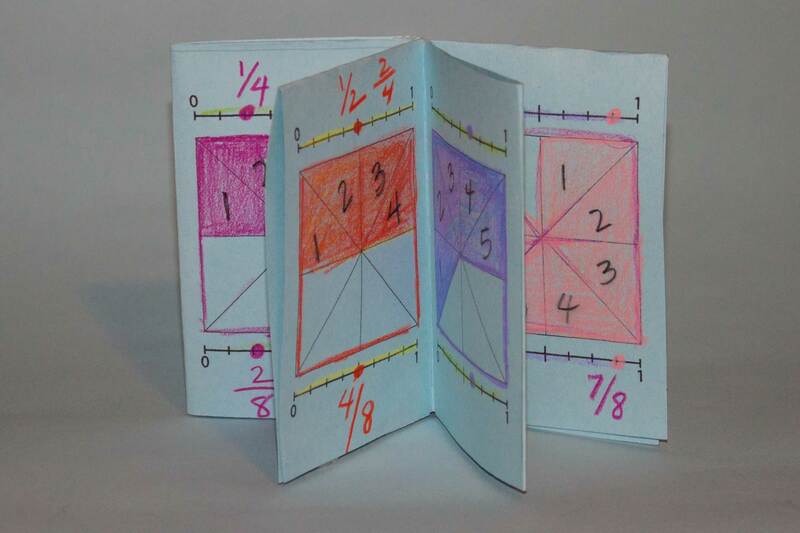 From this point on the books are folded according to the fractions that they are illustrating. Here’s the PDF for the book of eighths. 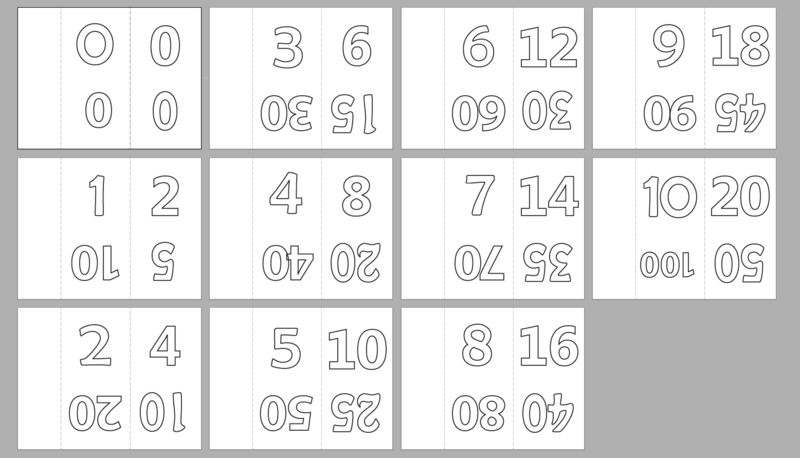 The illustrations on PDF are unadorned, on each page there is simply a square divided into eighths, accompanied by a number line labeled with a zero an a one (as suggested by Kristin Gray). I will leave it to the students to do the labeling and partition the parts. 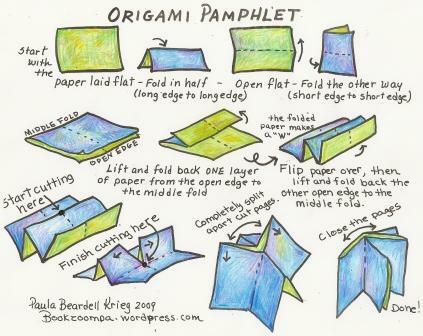 Here are its directions for folding. Here’s the book to show quarters. I’ve made a halves PDF for this too but I will be giving the students the option to make and partition their own images. 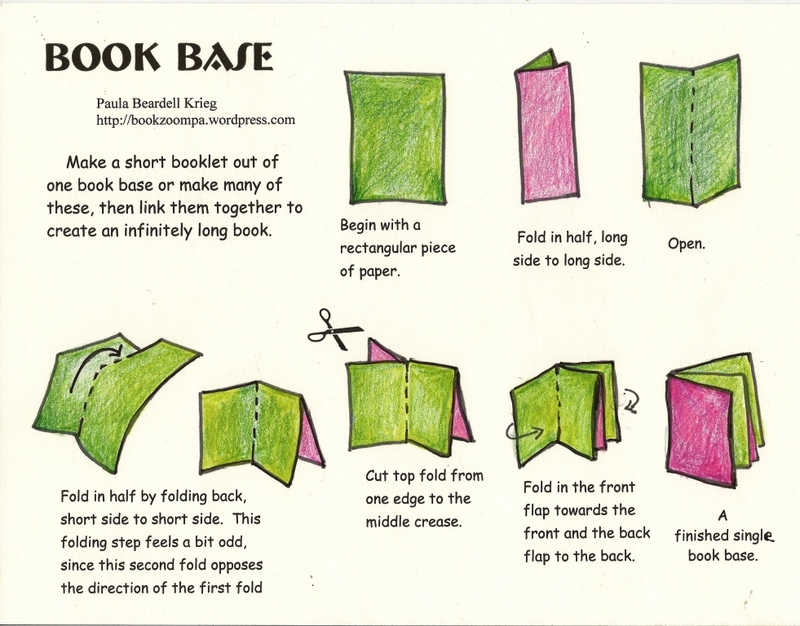 Here’s the directions for folding this structure, which I call a Book Base. The Twelfths book, again, is a pretty minimal PDF in terms of images. 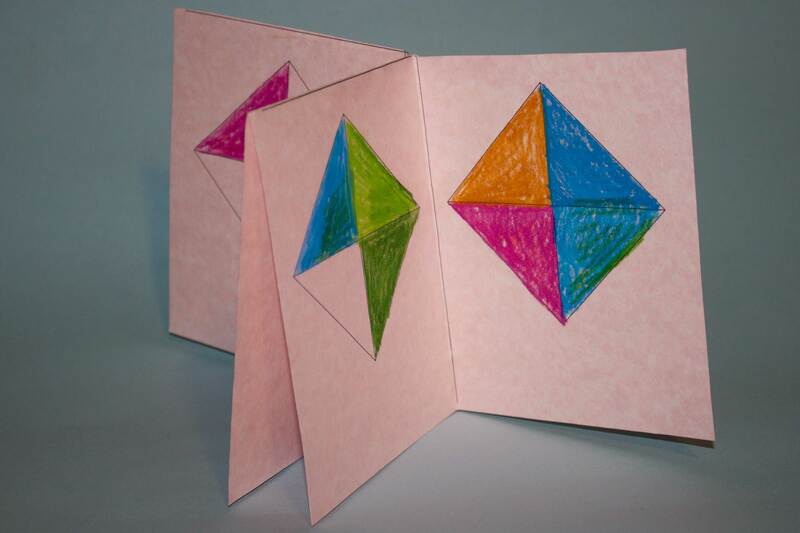 Each page has a twelve-sided structure, a dodecagon, which is divided into twelve parts. I added shading, which students can color in or keep plain, to show the parts of twelve on each page. I included these shaded areas because I don’t want these books to be about the coloring, and this would take too much time to color, though students who want to color certainly can. 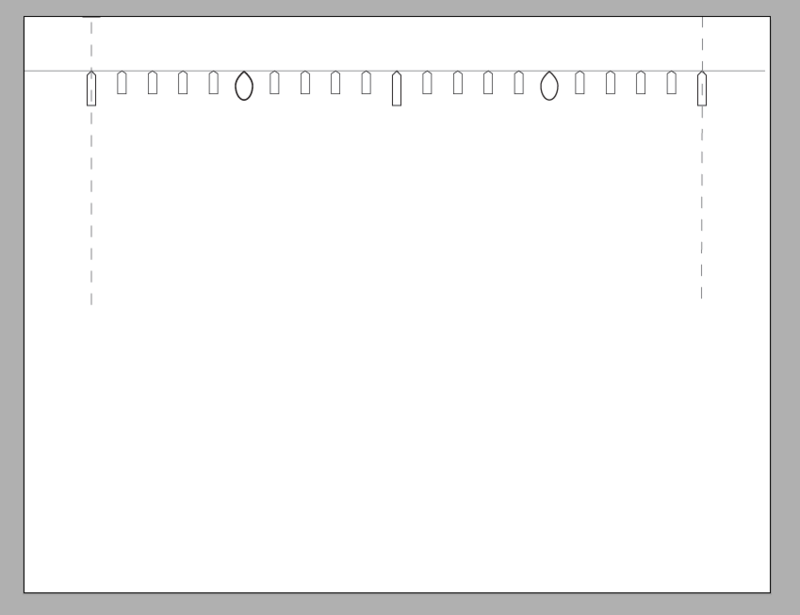 I don’t have printed directions for how to fold this structure, but I did include a scissors icon to show where to star cutting, and dots to show where to end the cut in the middle. 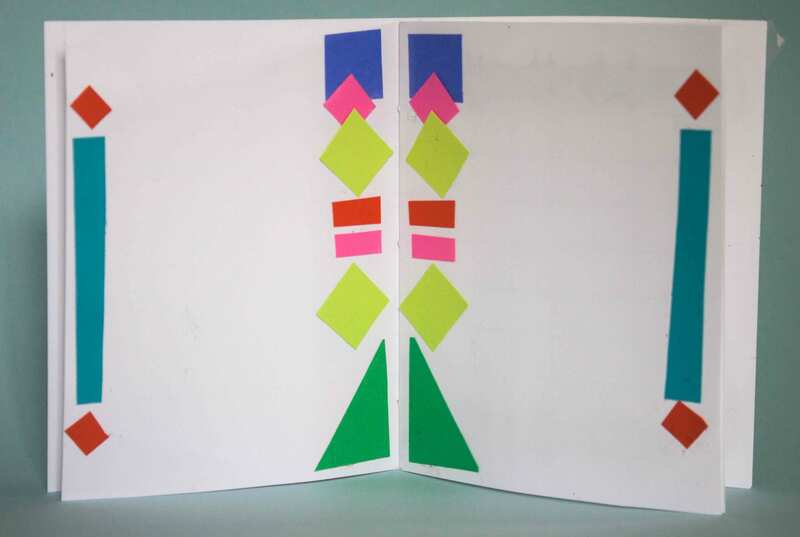 After the cutting is done it’s just a matter of making an accordion fold with the pages, exactly like an Origami Pamphlet. 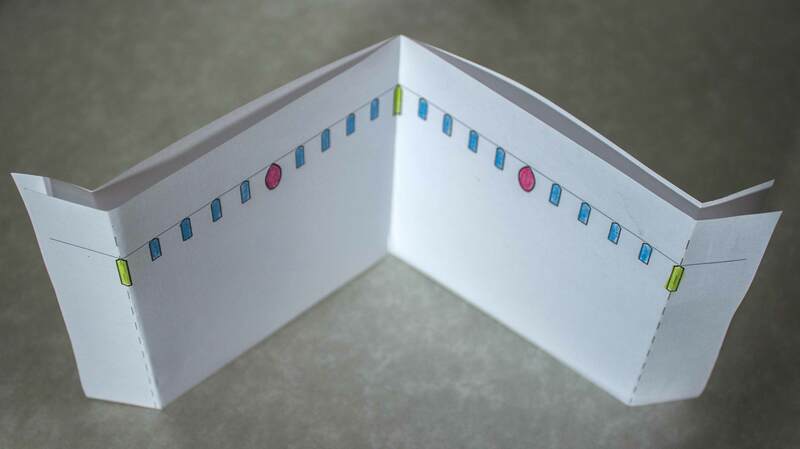 The number line for folder sports a dotted line to indicate where to fold up a flap for a pocket, so that all of the equivalent books have a place to get tucked into. Addendum: First day of this project went well. 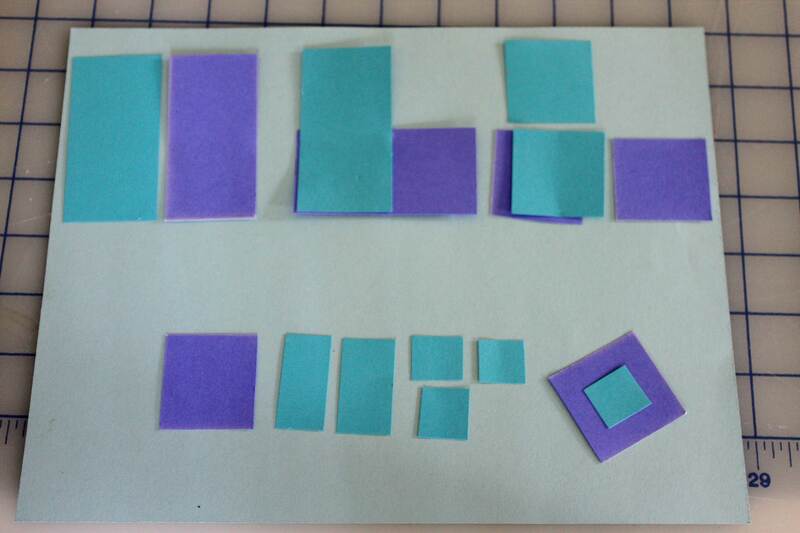 We talked about the fractions the students had been studying, and looked at the graphic of fractions on the folder. We also made the Book of Eighths. The students seem to make a great connection to this project. The math specialist at the school saw what we did and hunted me down express her enthusiasm about what she was seeing. 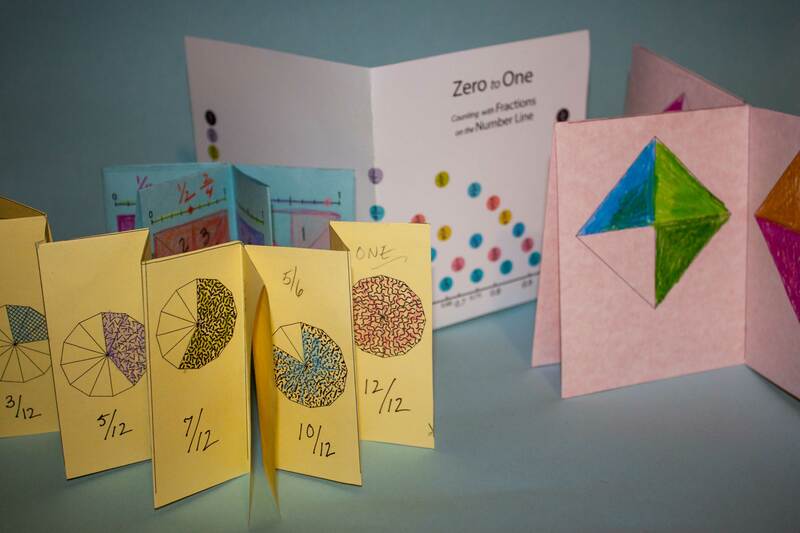 Her main comment was about how glad she was to see the number line so present in this collection of fraction books. 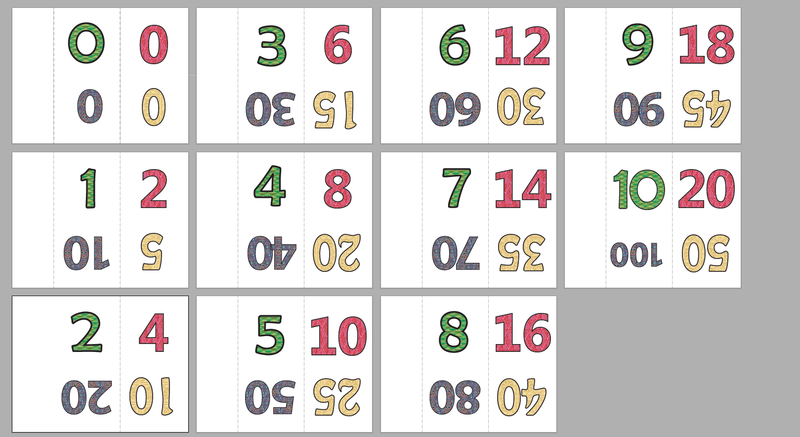 I’m once again revisiting accordions and number lines, because they are both infinity fun. 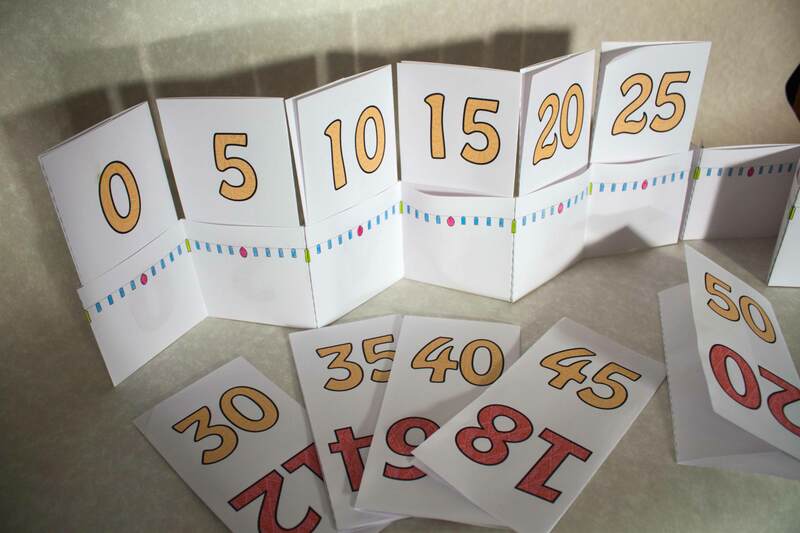 What I’ve attempted to do here is to create a classroom friendly accordion book whose pages are pockets which can contain changing content, in this case a variety of number lines. What makes this project classroom friendly is that it is designed to be used with a ubiquitous material: standard sized, standard weight copy paper. It requires a few simple folds, and very few materials. 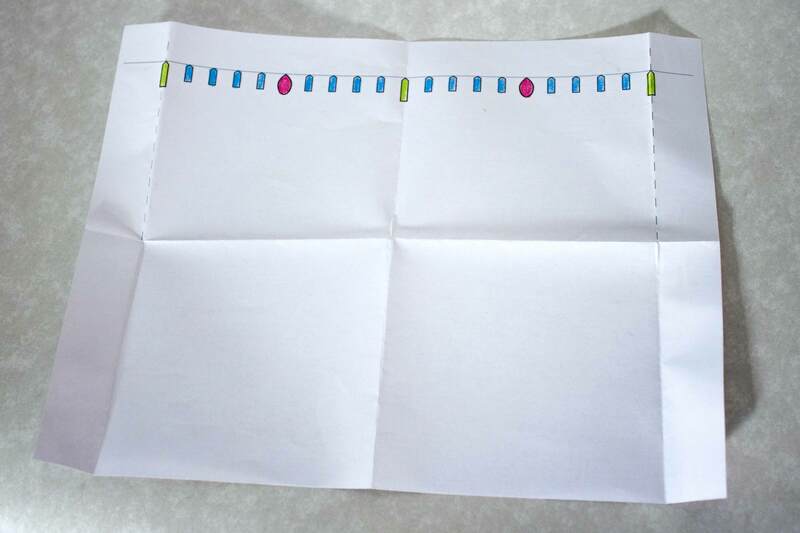 I’ve made templates that can be printed out, but lacking the resource of a copy machine, this can all be easily constructed without my templates. The shows where the fold lines occur. The tabs at the side are there to create an attachment surface for other the next pockets. 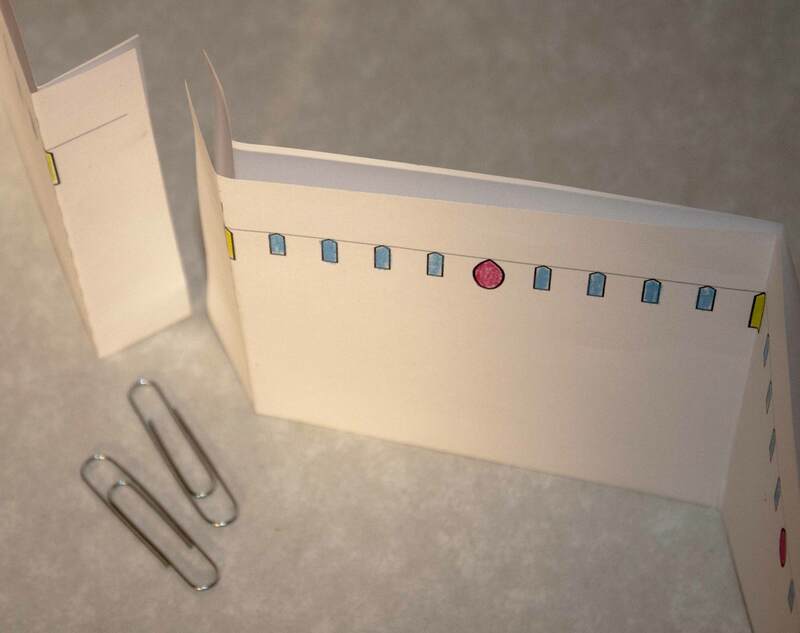 The tabs of adjoining papers can be attached with glue, tape, sewing, paper fasteners, staples or paper clips. I ch0ose paper clips. 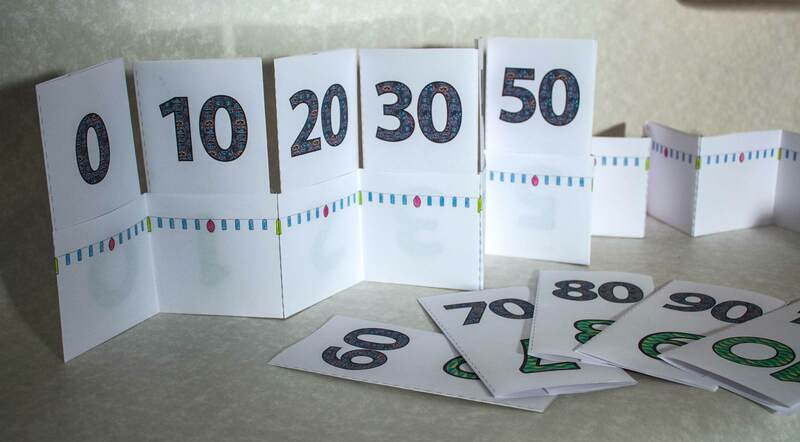 The cards with the numbers are also made from sheets of uncut, folded paper. They are folded so that they are just a bit narrower than the pockets. Once they’ve been folded they can be glued (or taped etc) shut but I don’t bother doing this, as they seem to stay together just fine without gluing. 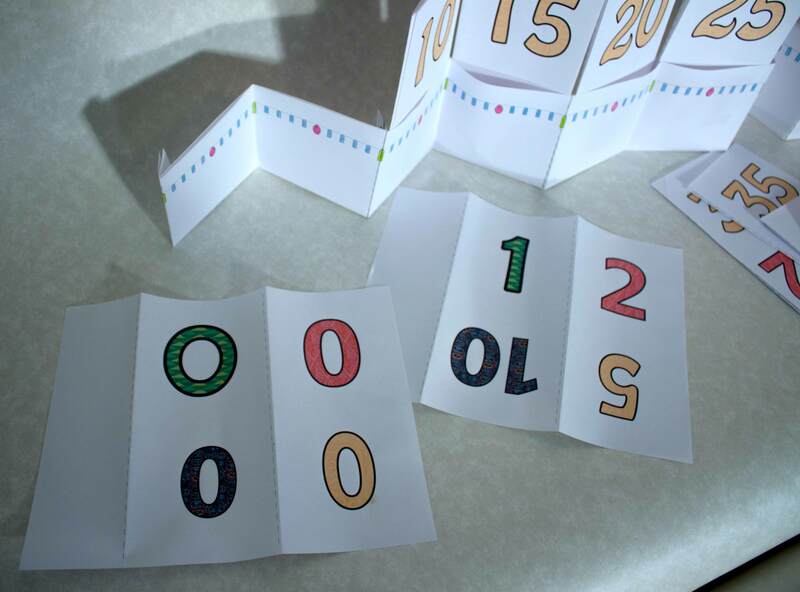 One set of numbers can make four different number lines. I’m providing links to PDF’s. There’s a PDF for the pocket, which I recommend that you make 6 copies of. This template is in black and white only. I hand colored in the dividing lines. 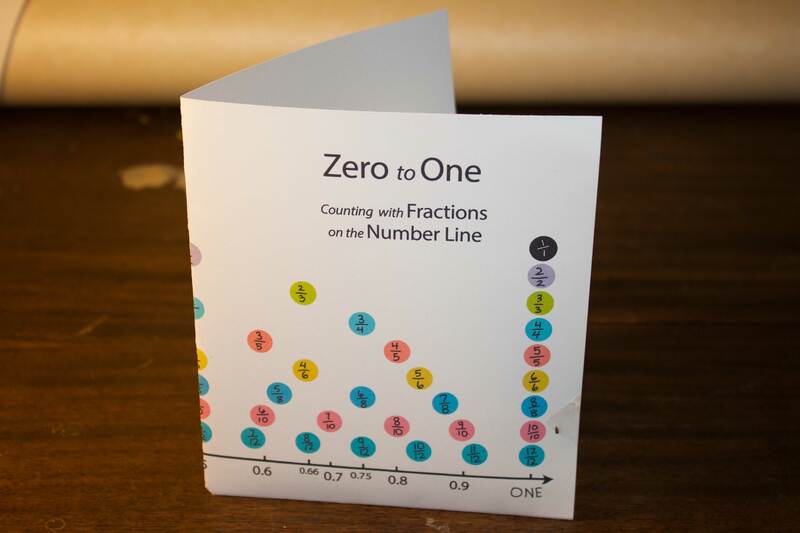 As for the numbers, I have one full color PDF here, and one that has the black and white outlines of the numbers if you prefer to let have your students color in the numbers themselves. At the moment I only have files for paper measured in inches, but in the next day or two I will update with A4 versions as well. 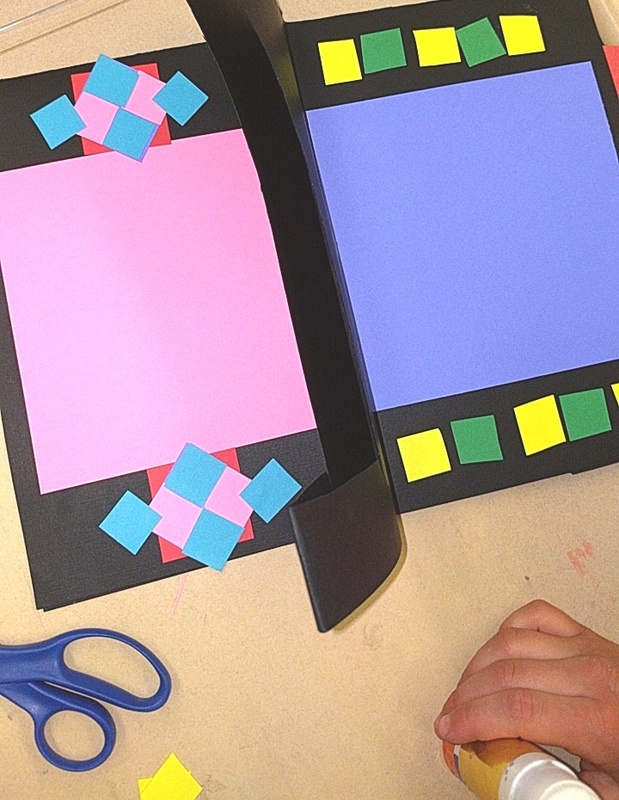 I would love to hear from anyone who constructs this project with a class! News Flash: A Codified Language Exists to Describe Patterns. I’ve been so excited to discover the way to speak about patterns. I’ve been teaching decorative techniques for a long time now. I’ve started trying to use more precise terminology in my teaching, and I suspected there was more to know. I started out looking at artistic and graphic design sites, really I did. 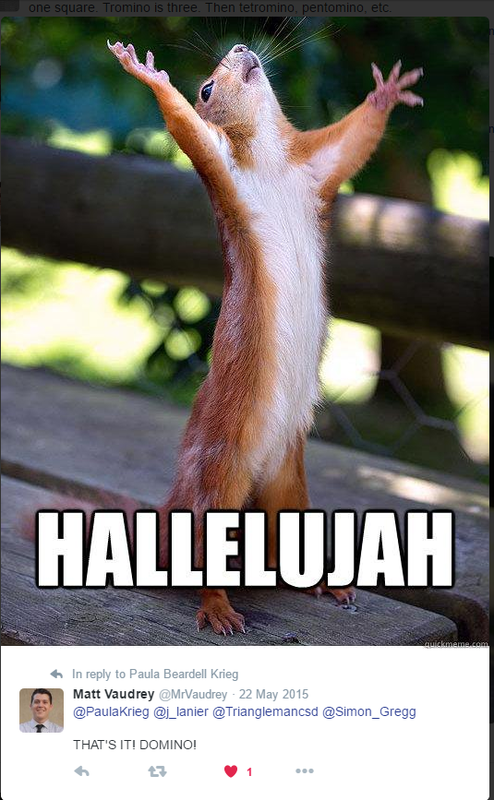 I looked on lynda.com, I looked on youtube, and poked around the internet in general. 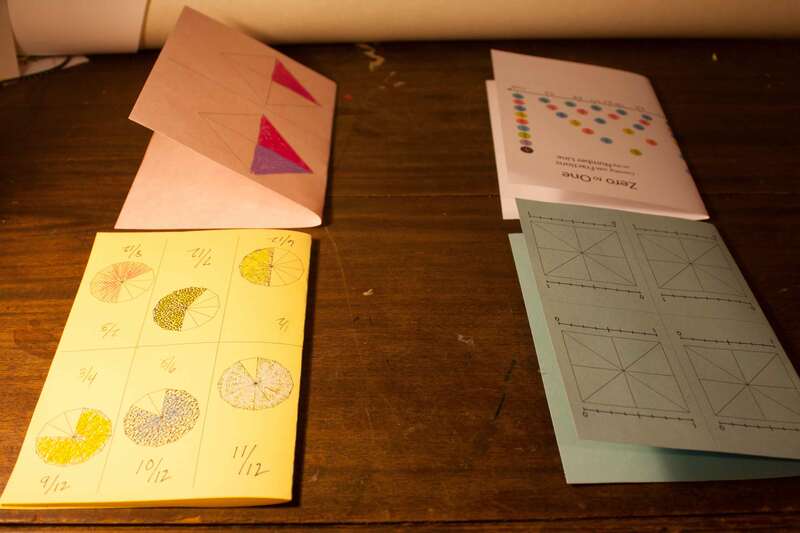 Then Maria Droujkova pointed me in the direction of something called Wallpaper Groups, and guess what, I landed on sites that described pattern making with precision, using the language of mathematics. The more I learn the more I understand that what math does is enhance the way that people can describe what’s in the world. It appears that hundreds of years ago mathematicians figured out how to understand and talk about patterns. This summer I’ll be teaching a week’s worth of classes to young children at our community center. I enjoy showing students decorative techniques, so my immediate interest has been to develop a modest curriculum that focuses on making books that are embellished with style. Even though many of the students will be at an age where they are still struggling with concepts such as “next to” and “underneath” I hope to introduce them to ways of thinking about concepts of transformation. Strip Symmetry is where I landed when I was surfing for a way to find words to describe the kind decorations I’ve been thinking about. In other words, the patterns I am looking to teach will have a linear quality in the way that they occupy a space, as opposed to being like a central starburst, or an all-over wallpaper pattern. It turns out that there are only a handful of words that are used to describe every single repeating linear pattern ever made. A Translation takes a motif and repeats it exactly. Vertical Refection mirrors a motif across an imaginary vertical line. The name of this particular transformation confused me at first, as the design itself extends in a horizontal direction, but once I prioritized the idea of the vertical mirror, it made more sense. Glide Reflection can be described as sliding then flipping the motif,, but that description sounds confusing to me. Instead, understand glide reflection by looking at the pattern we make with our feet when we walk; Our feet are mirror images of each other, and they land in an alternating pattern on the ground. 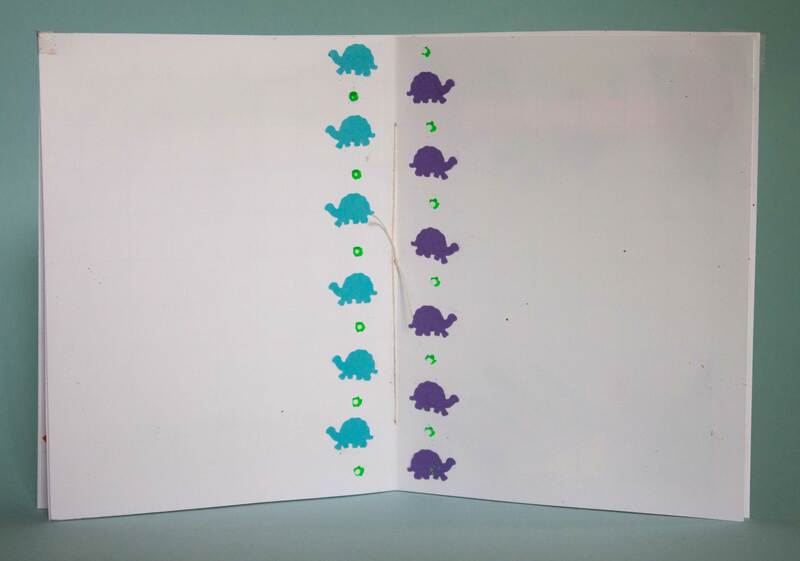 Imagine footsteps on top of each of the paper turtles you might better be able to isolate the glide refection symmetry. Horizontal Reflection mirrors the design across an imaginary horizontal line. Here’s a translation that shifts horizontally, but there’s no such thing as a strip symmetry that translates top to bottom. 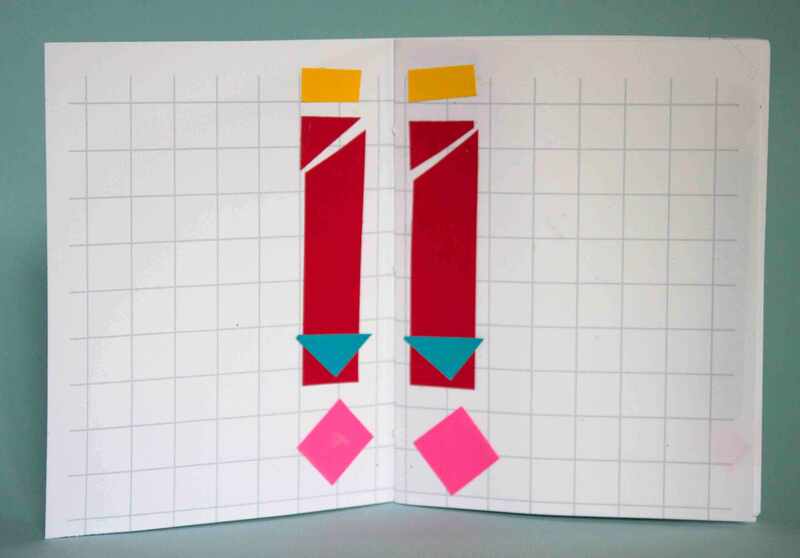 Instead, convention dictates that the viewer turns the pattern so that it moves from left to right. I was excited to get this response to the leaves image, as it reminded me that my newly acquired understanding of symmetries, though useful, is simply just emerging. 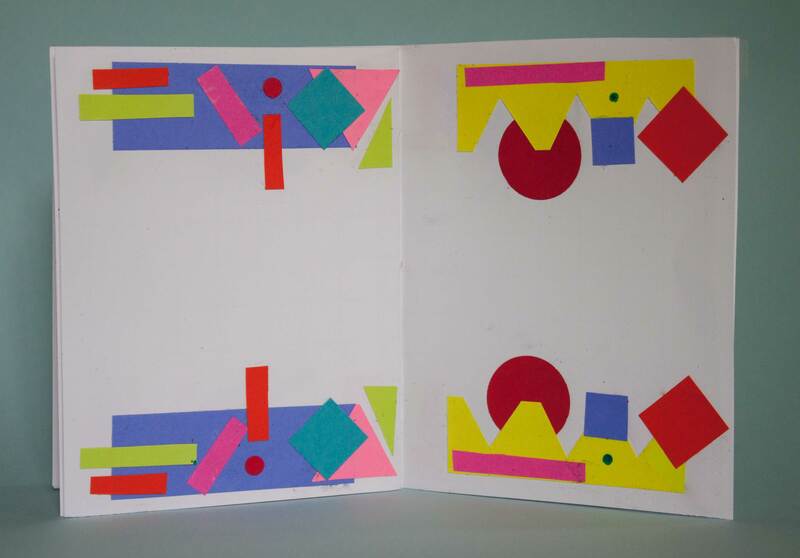 the book I made was too small (only 5.5″ high) because the cut papers then had to be too small to handle easily. 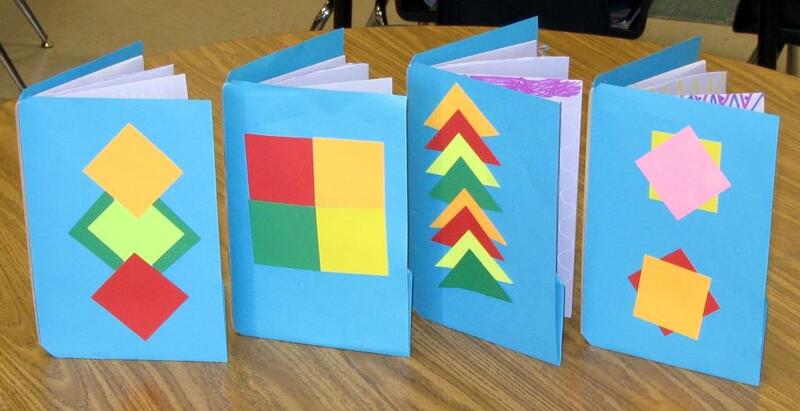 I’m thinking that any book I make with students needs each page to be at least 8.5″ tall. 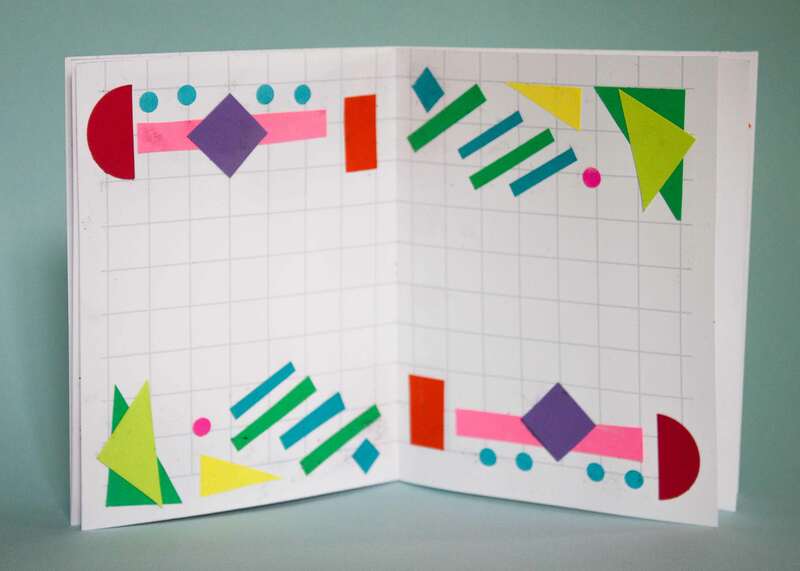 It was easier to create harmonious looking patterns when I started out with domino rectangles (rectangles that have a 2:1 height to width ratio), then cut them in half and half again to make squares, tilted squares,triangles and rectangles. I like the look of alternating plain paper and cubed paper. Folding paper that has cubes printed on just one side accomplishes this. I am going to enjoy teaching these college level concepts to young elementary children.